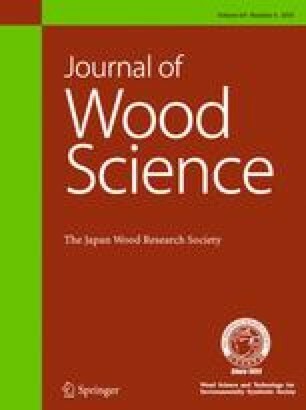 Sandwich compression of wood that can control the density and position of compressed layer(s) in the compressed wood provides a promising pathway for full valorization of low-density plantation wood. This study aims at investigating the effects of preheating temperatures (60–210 °C) on sandwich compression of wood, with respect to density distribution, position and thickness of the compressed layer(s). Poplar (Populus tomentosa) lumbers with moisture content below 10.0% were first soaked in water for 2 h and stored in a sealed plastic bag for 18 h, the surface-wetted lumbers were preheated on hot plates at 60–210 °C and further compressed from 25 to 20 cm under 6.0 MPa at the same temperature on the radial direction. The compressed lumbers were characterized in terms of density distribution, position and thickness of compressed layer(s). It was found that depending on preheating temperatures, sandwich compressed wood with three structural modes, namely, surface compressed wood, internal compressed wood and central compressed wood can be formed. Density of the compressed layer(s) in wood increased gradually as a result of the elevated preheating temperatures. Higher preheating temperatures gave rise to bigger distance between compressed layer(s) and the surface, and preheating temperature elevation from 90 to 120 °C contributed to a maximal distance increase of 2.71 mm. In addition, higher preheating temperatures resulted in bigger thickness of compressed layer(s) over 60–150 °C and temperature elevation from 120 to 150 °C lead to the layers integration from two into one. Further temperature elevation over 150 °C reduced the thickness of the compressed layer in wood. SEM scanning suggested that cell wall bucking rather than cell wall crack occurred in compressed layer(s) and transition layer(s). Ren Li and Zhiqiang Gao contributed equally to this work. The authors acknowledge the financial support from the National Natural Science Foundation of China: Formation Mechanism and Controllability of Wood Sandwich Compression by Hydro-thermal Control (Grant no. 31670557).